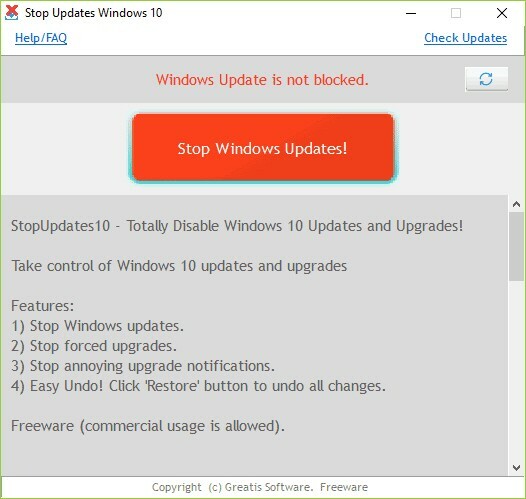 StopUpdates10 makes it easy for you to allow or block Windows 10 updates anytime. This app is perfectly timed for us. Our VMware started installing updates causing slowdowns and lag and aggravating us even though we had used similar apps to block Windows Updates previously. Microsoft has again changed how Windows Updates works, and most apps that prevent updates are now broken. Enter StopUpdates10. Now you can once again block or allow Windows Updates. Typically, it would be difficult to test how effective this app is, but we're in the unique position of knowing Windows Updates keeps running within five minutes of booting VMware. We're happy to report that it did stop updates. We waited 30 minutes to be sure. StopUpdates10 does require installation but is simple to use. By default, you should see "Windows Updates is not blocked" in red letters and a red button that says "Stop Windows Updates!" Once blocked, everything is reversed and in green letters with text that says "Windows Updated is blocked!" and a button that reads "Restore Windows Updates." Additionally, Greatis offers links to their other freeware programs including UnHackMe, BootReacer, Anti-WebMiner, and Edge Reset Button.